Wearing my skirt and top out fit today. The pictures did not come out so good, but it gives you an idea of how it looks. I am wearing it today as it is warm. I thought I would share something about some one else here. 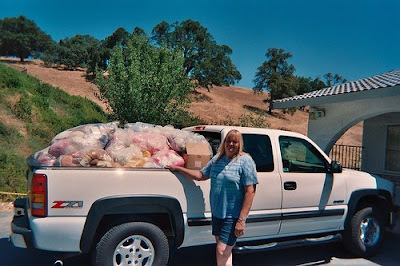 This is Linda and some of her yarn stash. 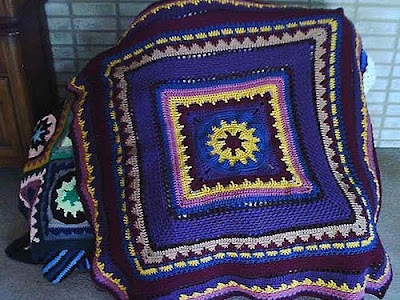 Linda is a very talented crocheter, I just love the assortment of afghans she pumps out. If you would like to see more of Linda's photo's, this is her flickr page. If you would like to see Linda's blog this is her blog page. 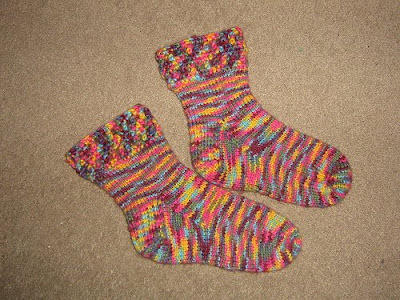 Linda has a new craze lately of making socks. My American Friend Linda, Sent Me a Parcel. I've been a member of hgtv for over a year now. It was the first forum I joined as I found it imformative and friendly. I have made some very lovely American friends on the board, shared patterns and had some good laughs. 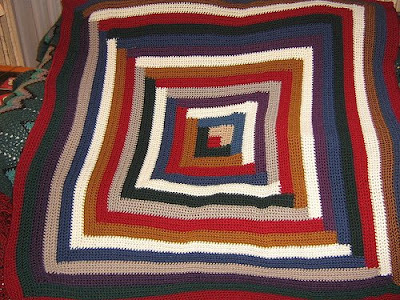 One of my friends is Linda, (warp speed linda, as she crochets very fast) when she knew I was after a knifty knitter, she told me that she had a rectangular one that I could have and she would send it to me. But she did not stop there. She filled a box full of goodies and sent them to me. She mailed the box from the US last Friday and I received it today (Tuesday). 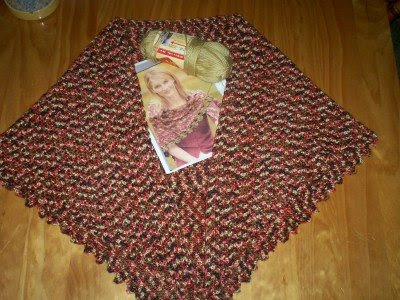 This is the shawl she made for me in the red heart soft yarn. I have finally seen her crochet work and it is high quality work manship and I just love the shawl! 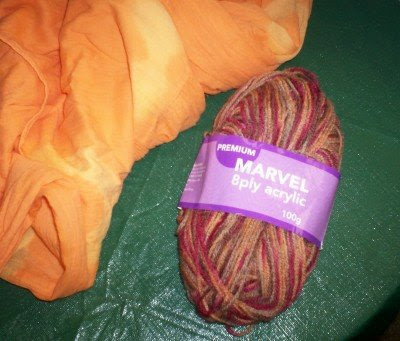 It really is a soft yarn too. Now these are the other goodies in the box. 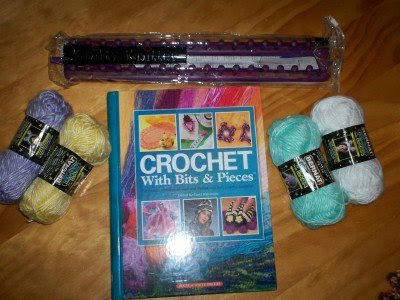 A lovely hard covered and spiral bound pattern book, the rectangular knifty knitter and some glow in the dark yarn which I so wanted to use. 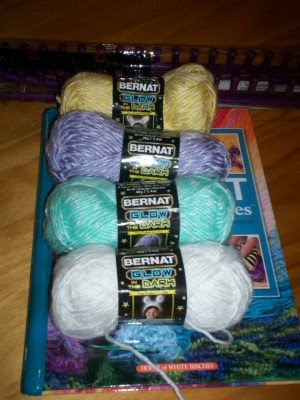 I can't wait to use this glow in the dark yarn in a project, I've seen it advertised and so wanted it. Now I have it, YES! 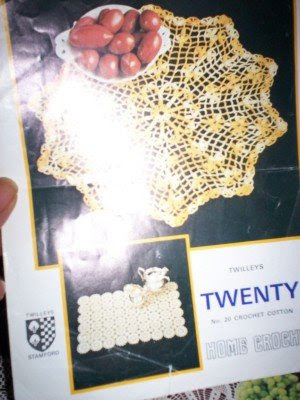 When people know that you crochet, they tend to be on the look out for crochet things. 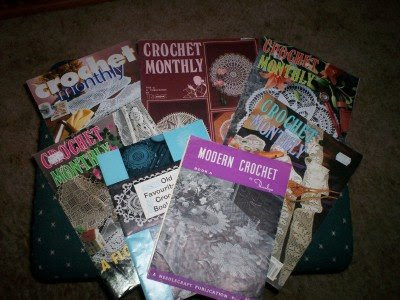 Below are some old to very old doily crochet pattern books, from the 60's to the 90's. These came from my Daughters boyfriends Mother. They belonged to her Mother. 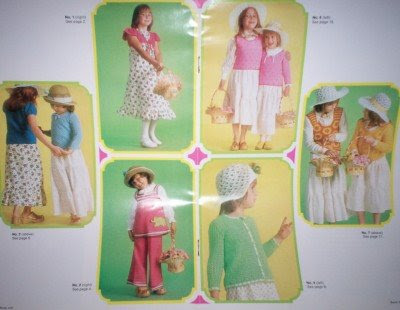 The prices on the pattern books are in the pound form and from Scotland and England. Some prices read 2/6 and others had the pound price of 1.20. 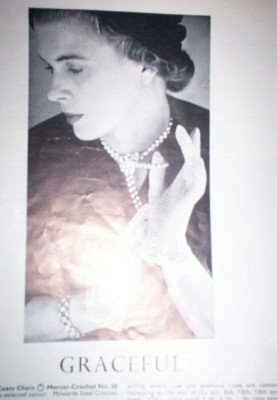 A lovely lacey glove pattern from one of the pattern books. Trolley mat and cosey set. My Mum and Step Dad came for a visit today, I was in bed when they came as I had not been too well. 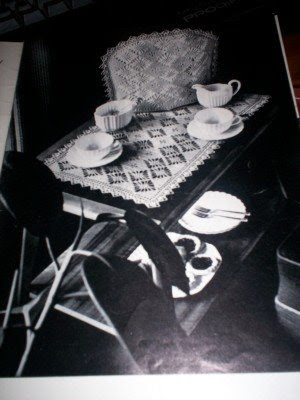 But they cheered me up by not only coming, but bringing me some items from a deceased estate. 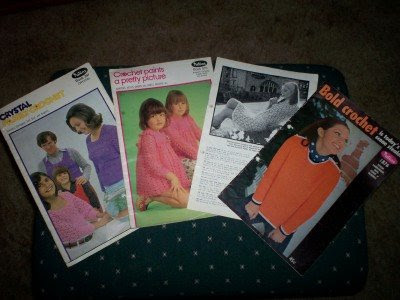 There were specific instructions that I was to have these crochet pattern books. 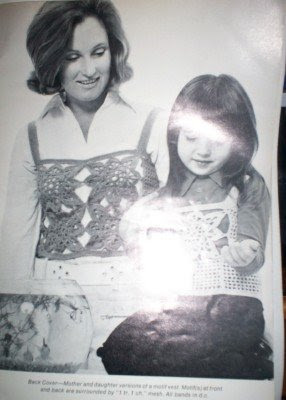 Centre page from one of the more modern 70's patterns. 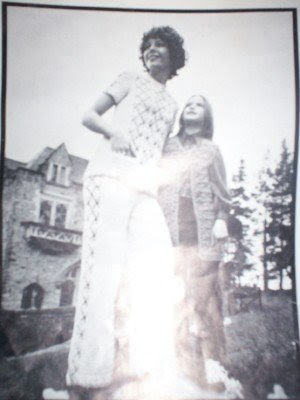 I would attempt the top, but the pants? Pity the camera flash is too flashy, for these twin cardigans. These are sead beads in a 500gm jar that my Mum and Step Dad brought down too. My step dad says I have to count them before I use them, LOL. 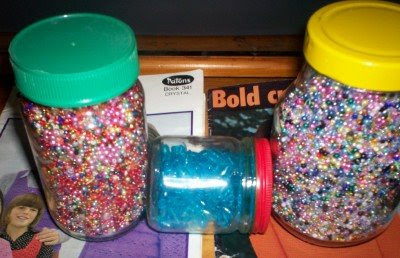 The middle jar has larger lovely blue beads too. It's so nice to receive things when you least expect them. This was a project I had in mind from January this year. 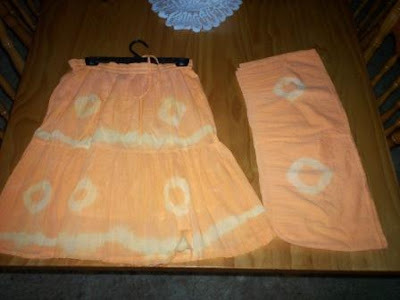 The skirt was ankle length and I cut it to knee length. 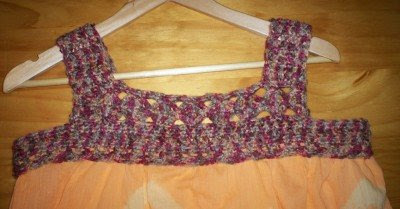 The piece I cut out off the skirt is going to be a matching top, with a bit of crochet to finish it off nicely. I was initially going to have the piece doubled, but it was a bit too short. 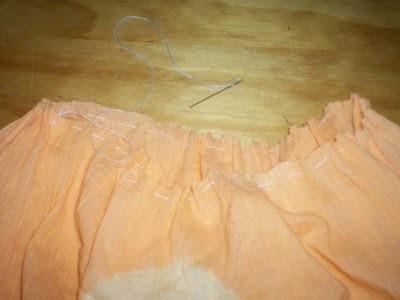 So now I am going to cut it in two and sew one piece on top of the other. I did not have much of a yarn choice and this was the closest match I had on hand. This is the top piece sewn with one piece on top of the other. had just made. Being fresh in my memory it was too easy. Here I am making a gather at the upper part of the top, so I can sew it to my crocheted piece. Just making a quick size comparison here. 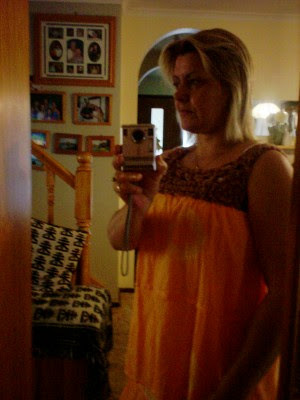 Here you go, my crocheted piece sewn on with shoulder straps too. I left the shoulder straps to last, to ensure it would fit me. The matching top and skirt. I purchased this skirt from the op shop for a couple of dollars. All in all I would say I now have a cheap and trendy out fit. 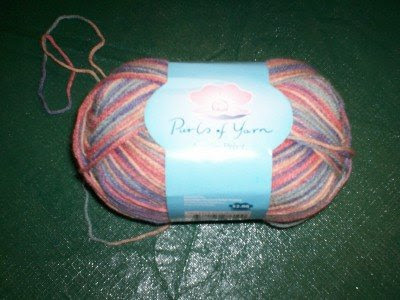 I used a variegated acrylic yarn, it took 250 gms of yarn to make. 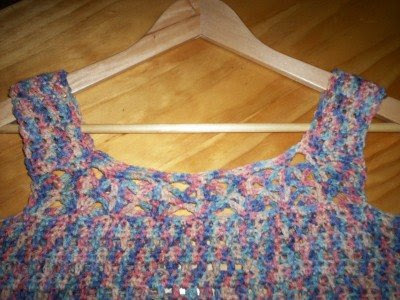 The Tank is made with hdc, the pattern I used is called the Preppy Tank from Crochet Today Sept/Oct 2007. 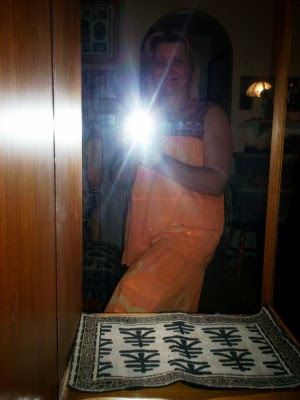 It is made a little on the loose side to wear in Spring and Summer with a singlet top underneath. I found it a tad too short, so I added a fringe to give it a little more length. I really like the stitch pattern used at the top of the tank. 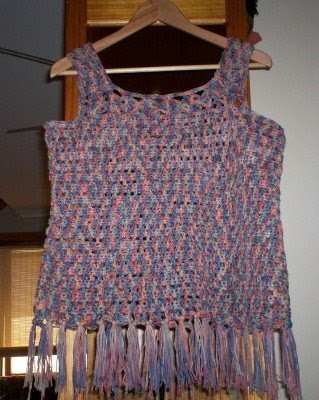 I'm already onto my next Spring/Summer top, it's a project I wanted to do last year. 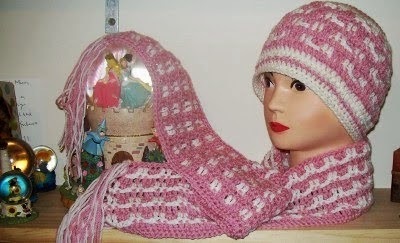 What you can do with Tunisian Crochet and links too. This my 13 inch Afghan Hook. Now this is also a 13 inch Afghan Hook, which has 180 stitches on it. Wow! This belongs to Rachal-G from hgtv. 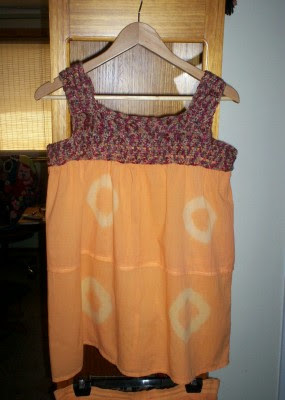 I plan to add Tunisian Free Pattern links to this post, so check back for updates. ALL Row Counts at this web site are done for the Afghan/Tunisian Stitch. ALL of these row counts can be converted for single crochet by reversing every other row to allow for the turning of the afghan. Ocean Waves Dishcloth (Tunisian) . Pretty one. Crochet Australia. 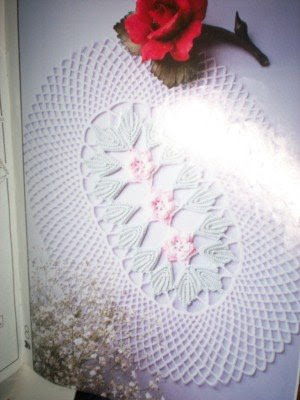 Tunisian Hooks and Pattern Books for sale. 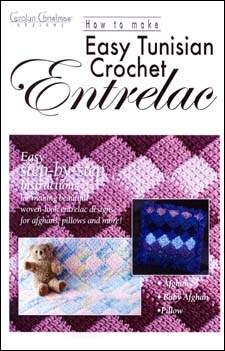 Tunisian Pattern Book, available from crochet Australia. 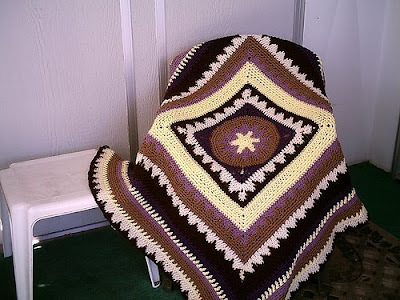 Want to make an afghan with the Tunisian Crochet method also known as the afghan st? 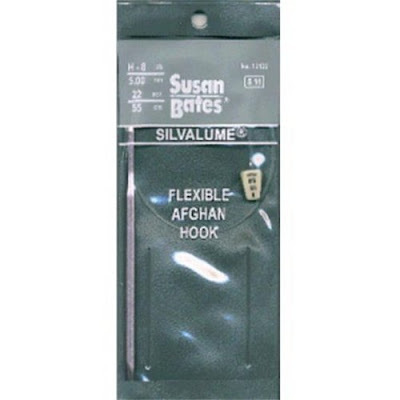 You can buy a flexible Afghan Hook for lots of cast on stitches. Too small a hook you say, well watch the video below, you can get much bigger ones and make a very large afghan in about 12 hours I believe. A New Addiction. 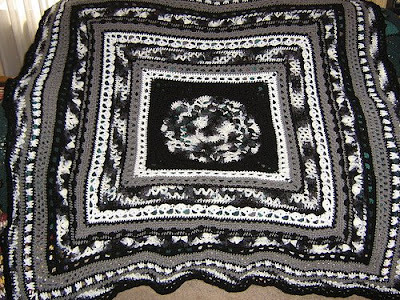 Tunisian/Afghan Crochet. My extremely new experience with Tunisian crochet may be of a help to others who are trying this method first hand too. 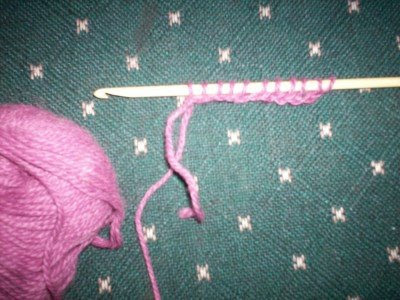 Below is a picture of my hook, which is called an afghan hook. It is a size AU 5 mm (US 8). It measures about 13 inches long and has a hook on one end and a stopper on the other end, it's cross between a crochet hook and a knitting needle. 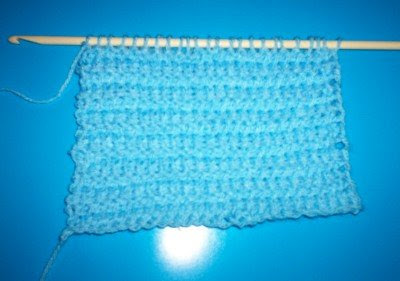 You can use a normal crochet hook for smaller Tunisian projects. 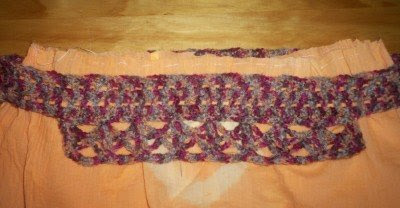 The starting off method is just like crochet, chain the amount of stitches that you need. 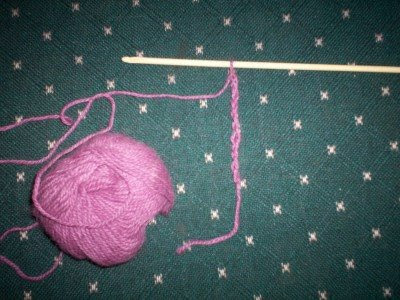 But now it looks like knitting once you have completed the forward pass, by picking up a loop and pulling your yarn through the loop and keeping every single loop on your hook. Now this is the return row, pull yarn through 1 st first, then pull yarn through 2 stitches at a time until you reach the end of the row. 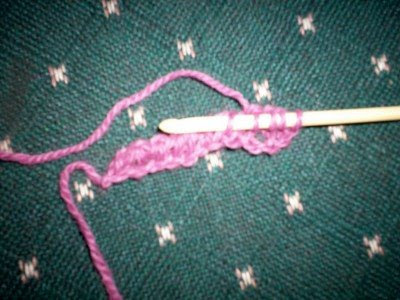 On the forward pass row, this is the front loop you will pull your yarn through. 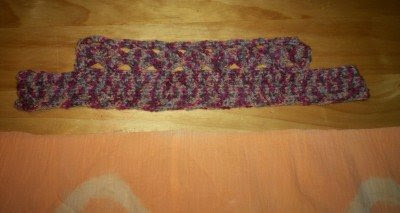 This is a sample of the tunisian crochet stitch after a few rows. 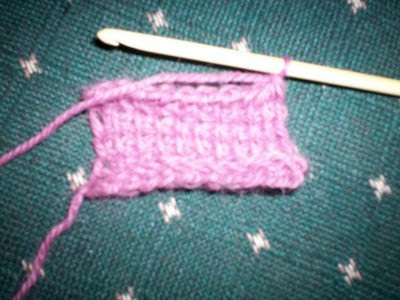 Just as in crochet and knit, Tunisian crochet has several types of stitches you can use. Below I have alternated rows of TSS (tunisian simple stitch) and TPS ( tunisian pearl stitch), this pattern makes for a nice closed stitch and I believe is very popular for dish cloths. Now before I began to making any thing I went to youtube and watched a couple of good video clips. So I sat down and tried it, but some thing was very wrong. When Katie had given me a quick lesson last Saturday, she was picking up the very top loop only and said that is how it is done. I picked 2 you tube video's to watch, which were informative. But I got more confused, why is my Tunisian crochet looking like I have just knitted a few rows, so I tried what Katie had shown me and there was the Tunisian look that I had wanted. 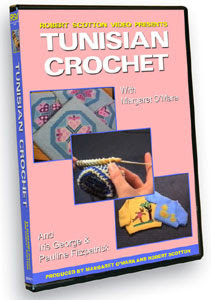 I went and watched the videos once again and realised there is Tunisian Knit and Tunisian Crochet. 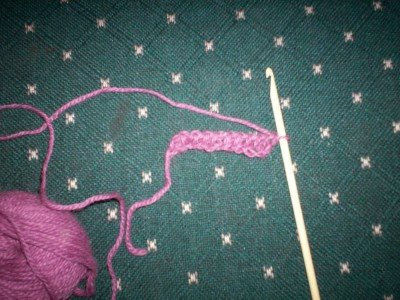 Tunisian Crochet picks up a single front loop, where as Tunisian Knit goes through the middle, out to the back and picks up the loop and draws it out to the front, 2 very different methods. I had been watching a crochet and a knit video, no wonder I was confused. 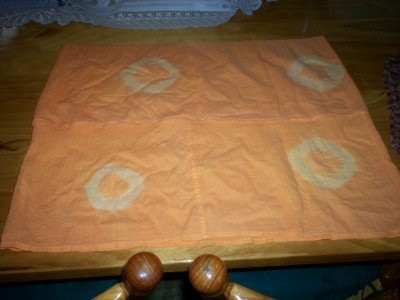 I have also come across some very good video clips on next stitch. 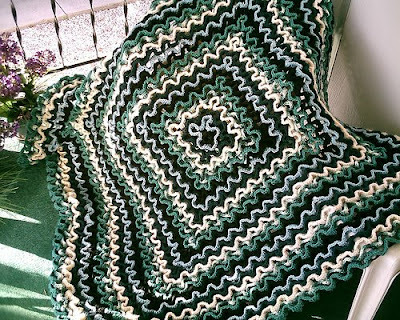 Crochet Afghan Tunisian Stitch - Part 1.